Yes, I have maintained a mostly silent presence on the Web lately. Then again, a lot has happened since we left Taos, New Mexico, for Charlemont, Western Massachusetts, a few weeks ago. But to get to the heart of it: I am fine and learning my way around. First: the 2,400-mile trek. As I predicted, Hank drove it in three days, staying in Kansas one night and Ohio, the next. He could have stretched it, but he saw the finish line and just kept pushing. Besides, we had the cat. Two (we named her that because she reminded us of our two best cats) was one unhappy passenger in her carrier. That lasted until Walsenburg, Colorado, where from thence forward she was on my lap. She perked up nicely in the hotel room — finding a cat-friendly hotel was another challenge — and was attached to me when she wasn’t. Where did we land? We are renting the bottom floor of an old house on a busy road in a tiny town. The Deerfield River is past the large field below the house and beyond the river are train tracks. Our neighbors upstairs are very likeable, as are our landlords. 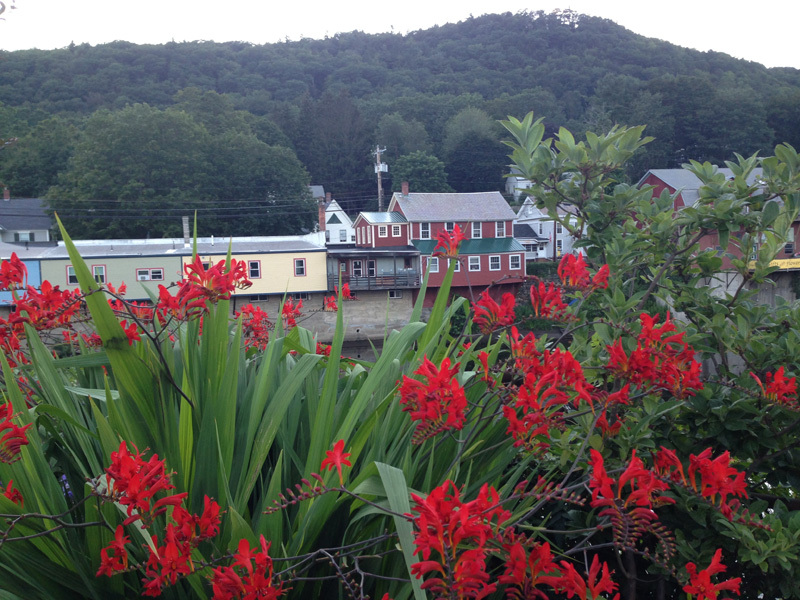 We are within walking distance to a couple of restaurants, a jam-packed general store, and the post office. It’s a short drive to a swimming hole and a bit longer to Shelburne Falls, where our son, Zack, is opening his brewery. We somehow managed to fit the contents of a small house into this apartment. Hank and I realized we have much more art and furniture, most of which he built, than when we arrived in Taos 11 years ago. A couple of framed pieces are stowed under the bed. Boxes are stacked in the corner of a bedroom. But the wooden furniture, boxes, and frames Hank built make any place look great. By the way, my new place to write is the dining room table. I had to relinquish my Shaker-style desk to use for storage in the kitchen. It works. What about the family? We saw three of our kids at one gathering last weekend. We visited Nate’s new home soon after its closing Tuesday. Later that day, we attended a hearing in Buckland for a pouring permit for our Zack’s brewery — one of the selectmen told us he had skied at TSV — and have stopped by when he’s working there. Hank will be helping both sons on their projects. Other amenities? Sweet corn sold everywhere, including along the roadsides. Blueberries. Really fast internet. Moisture. Trees. Greenery. Food co-ops. One glitch: In order to have that really fast internet, we had to get a landline. Good thing since we don’t have cell-phone service at home yet. We’ve been driving around looking for a permanent place. Friday, when we visited our former town of Worthington, we stood outside the general store and saw seven people we knew well. We toured one house in Buckland and did drive-bys of others that looked a whole lot better online than in person. We remind ourselves we’ve only been here a short time — two weeks as I write this. We will eventually find the place that is ours. But, for now, here I am. ABOUT THE PHOTO ABOVE: I took this from the Bridge of Flowers. Zack’s Floodwater Brewing will open in the building across the river with the porch. I typed the first draft of The Sweet Spot, my next novel out, with only one hand. It was summer 2004, and I was recuperating after getting hit by a car as I walked across the street in Northampton, Massachusetts. 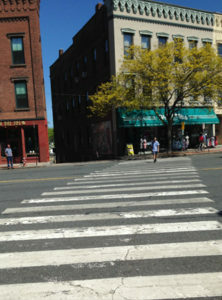 I was in the middle of the crosswalk on my way to get coffee before I headed to the newsroom. (The driver claimed he didn’t see me.) The impact threw me into the air and broke my collarbone. Something on the hood of the car cut the back of my head. It could have been much worse. I am grateful for that. I missed work for a week. I was a copy editor then for a daily newspaper. When I returned, I got good at typing with one hand. Ice and the meds I took then helped. Plus Hank, who had a job in the valley, drove me back and forth to work until I mended enough to drive. And that’s when I started The Sweet Spot, which has been the novel’s name all along. I set it in the hilltowns of Western Massachusetts, where I lived then. The small town of Conwell is pure fiction, but I feel I made it believable enough that I could plunk it in the middle of Worthington (where we lived) and its neighbors, Chesterfield and Cummington. The year is 1978. No cell phones or email. I didn’t know anyone who had a computer at home. The Vietnam War ended officially three years earlier. The characters are locals, except for one important newcomer. I set the stage with softball and baseball games, a Fourth of July parade, a general store, a swimming hole, and raucous nights at the local bar. Emotions get high. As I learned as a resident and reporter, things can get mighty personal in a small town. In this case, Edie St. Claire, one of the main characters, messes up big time. Most in Conwell won’t let her forget it. And there are feuds. Edie’s father, who runs the town dump, has an ongoing one with the road boss. Pop keeps taking stuff that belongs to the highway department, and the road boss gets his revenge by plowing and grading their dead-end dirt road last. I remember coming home and letting the words flow one after the other. I don’t know where they and this story came from, but there it was, 80,000 words later. I also got quite good at typing with only my right hand. I sent the manuscript to my then-agent. His suggestion: start from the middle. I reworked the novel that way. He pitched it to two publishing houses: both editors took a pass. One of them died the next day in surgery. True story. Slow forward ten years later. I reread The Sweet Spot. I loved it enough to tear it apart and rewrite it. I added much more dialogue thanks to the encouragement of my then-agent. But alas he couldn’t sell it either. My pitches to other agents and indie houses after I let him go were unsuccessful. So I will be publishing it myself. I feel it’s too good a novel not to let people read it. Very soon. 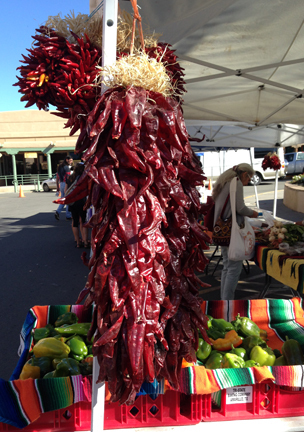 ABOUT THE PHOTO ABOVE: Chile ristras hang from a vendor’s booth at the Taos Farmers Market on the Plaza. The Sweet Spot is the next novel I will be publishing. I like the title very much, and I’ve stuck with it from the start because it has many layers. This is the first of what I call my hilltown novels. They are set in Western Massachusetts, where my family and I once lived for many years. I call the novel’s town Conwell. It doesn’t exist, but if it did, it would be located in the hills west of the Connecticut River and to the east of the Berkshires. But not only did I live in one of those hilltowns, Worthington to be specific, I reported on them for the local newspaper. I sat in numerous meetings, interviewed countless people, and covered whatever news happened in them. I got schooled on how people talk and act. I am grateful. So like other authors, I take what I know and, as I’ve said before, have my way with it. Yes, in my mind, the hilltowns are indeed a sweet spot even though this is not that kind of a book. Here is a brief synopsis: Most in Conwell love Edie St. Claire, the widow of a soldier killed in Vietnam, until her affair with his married brother ends tragically. She tries to survive this small town’s biggest scandal through the help of her rough-sawn family and a badly scarred man who’s arrived for his fresh start. She also plays on the Conwell Woman’s Softball Team, and naturally batters try to hit the ball where it will create the most velocity aka the sweet spot. Right now, I am still giving The Sweet Spot extremely close reads. I am compiling parts for the back of the book, my bio, acknowledgements etc. for Michelle, its designer, when she is ready. Expect to read more posts about the novel, like how I typed the first draft with one hand while recuperating from being hit by a car. I will write about the novel’s characters — Edie’s family is a colorful group — and other topics. For those posts, I will be pitching The Sweet Spot. 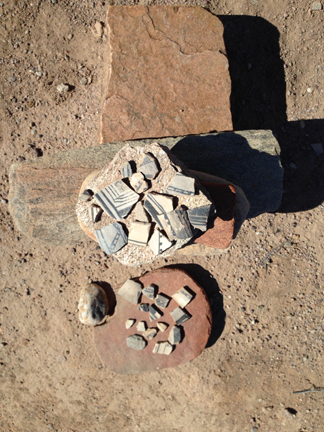 ABOUT THE PHOTO ABOVE: Those are ancient pottery shards spotted on a hike above the hot springs at Ojo Caliente in New Mexico, not too far from where we live. There are many shards scattered on the ground, and I am pleased my fellow hikers let them be, as we did.